The exhibition Opening Lines: Sketchbooks of Ten Modern Architects features selections from one of the world’s great architecture drawing collections installed in the most important gallery devoted to the subject. 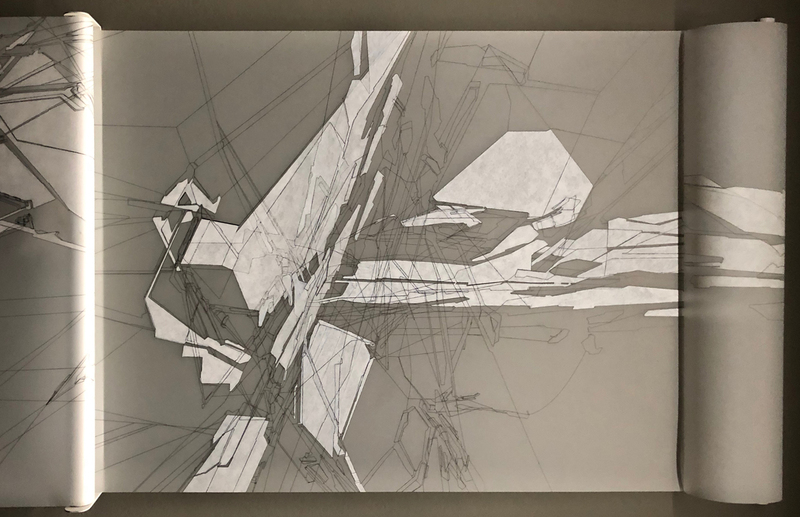 The exhibit at Berlin’s unique Tchoban Foundation is spectacular for anyone interested in architectural drawing and its relationship to the larger built and unbuilt culture. 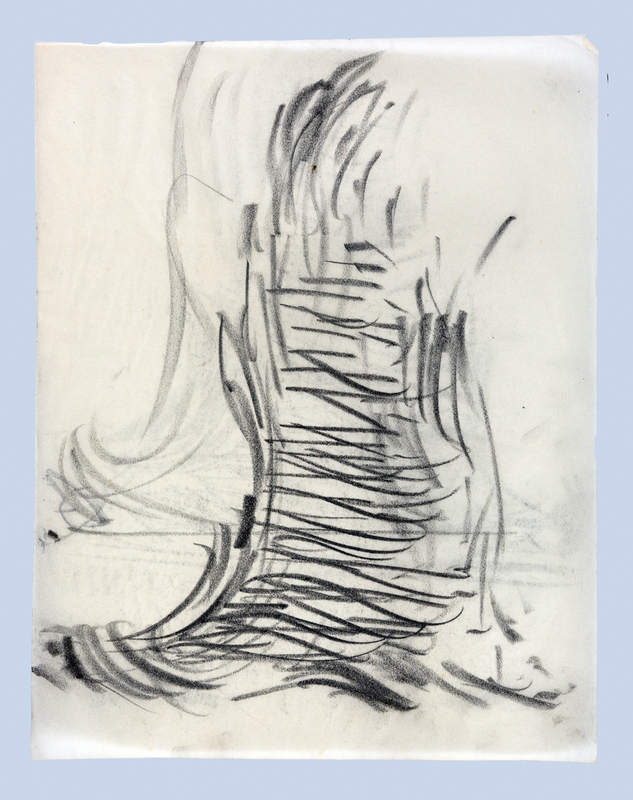 The drawings are from Drawing Matter, the personal archive of Englishman Niall Hobhouse (a few works from other collections were donated for the show), which is normally housed in the Somerset countryside of England. In Berlin, it includes 80 drawings and 140 sketchbooks, films, audio interviews, virtual, and analog facsimiles. The collection is still being actively assembled by Hobhouse who with the intellect and trained eye of an art dealer collects drawings that represent key projects from the most important architects. The archive specializes in early drawings, particularly extended notebooks of master designers like Peter and Alison Smithson, James Gowan, Aldo Rossi, the Italian Radicals of the 1960s, and Álvaro Siza. The collection could itself be a stand-alone architecture drawing museum, but for this Tchoban edition Hobhouse and curators Tina DiCarlo and Olivia Horsfall Turner have selected renderings, working drawings, theoretical sketches and doodles from Hans Poelzig, Le Corbusier, Alberto Ponis, Adolfo Natalini of Superstudio, Álvaro Siza, Tony Fretton, Marie-José Van Hee, Peter Märkli, Níall McLaughlin, and Riet Eeckhout. The range and depth of the Drawing Matter collection allows the exhibit to begin with a magnificent swirling and vibrating 1922 Hans Poelzig charcoal sketch for a monument in a university courtyard. This charcoal is a more spirited example of the possibilities of expressionism than any of his earthbound buildings. In fact, many of the drawings in the exhibition help us better understand their resulting built works either because their construction masks their intentions or possibly misses the mark of the drawn idea. Peter Märkli’s 1992 ballpoint sketch for La Congiunta, fleshes out the intentions of his building, which in its extreme concrete soberness can seem like little more than a Swiss box without knowing or seeing the drawing. A confident 1986 Tony Fretton ink sketch for a door jamb in the Lisson Gallery highlights the thought and intention behind his minimal aesthetic which again can easily fall away for the inhabitant of the building. But it is with a vitrine of multiple sketchbooks by Adolfo Natalini, opened to a series of his 1969 ink drawings of the Continuous Monument, where we can truly see the open-ended, discursive potential of drawing. It shows the evolution of ‘monumenta continua’ from its inception as town planning for a scaled ring around Florence to its first public presentation in Grazerzimmer (room of Graz) to a furniture concept and then a hovering structure over the cityscape of Manhattan. Hand drawings were the primary tools of the architecture debate in 1969 when he co-created Continuous Monument and it is impossible to comprehend the power of these images at the time they first appeared without seeing these sketchbooks. 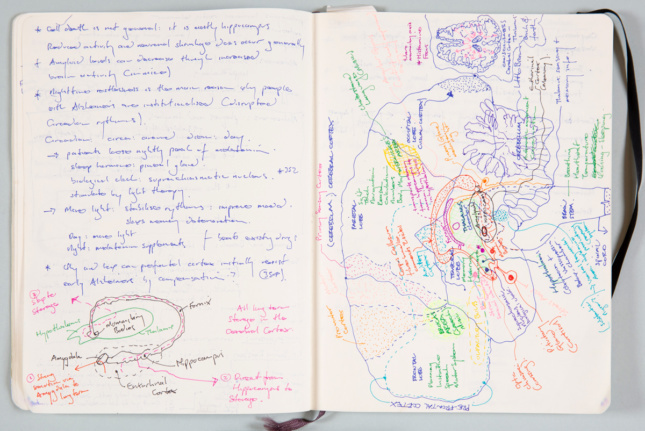 The possibilities of sketching, even doodling, as thinking are highlighted by Niall McLaughlin’s colored felt-tip pen drawings of the Alzheimer’s Respite Centre which are framed in the shape of a brain. 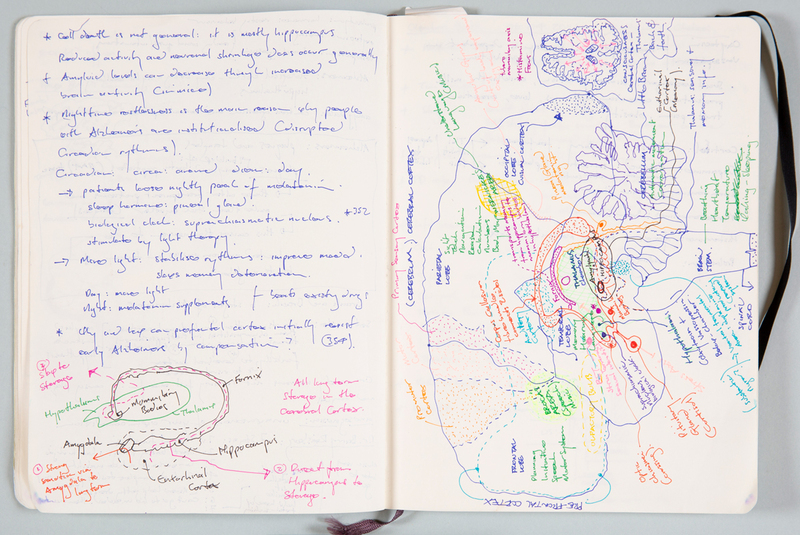 In McLaughlin’s drawing and handwritten text on view we can see his brain thinking out the possibilities of an architecture for the Alzheimer’s facility. I approach a project from several sides, each time engaging in a full body contact with the place, the program, and the limits. The weapons I have available in this battle (which is more like Jacob’s wrestling with the angel or a battle of love) are few, and among these drawing is the most important. Drawing allows me to be a lot quicker, and at the same time, it forces me to stay rooted to the page and the project for long periods…Drawings produce other drawings and these, other drawings again, and in this way, gradually the labyrinth appears and project emerges.